The belief during the early 1900s was that the universe was infinite and static. Einstein's original general theory of relativity was not compatible with a static universe. The equations indicated that the universe was either expanding or contracting. Einstein also thought the universe was static, so he modified his original equations to incorporate a static universe. When Edwin Hubble discovered that the universe was expanding, Einstein retracted his modifications, calling it the biggest mistake of his life. The definition of a "horizon" in cosmology is the inability to receive any type of signal from a very distant source because of the finite speed of light. The microwave background radiation coming from extremely distant parts of the universe all have exactly the same average temperature but are too far apart to have ever communicated with each other, even with signals traveling at the speed of light. Temperatures of the background radiation were just "assumed" to be the same everywhere in the original Big Bang Theory. Hence the "horizon issue" - How did the temperatures get to be exactly the same everywhere? Based on Einstein's General Relativity, the original Big Bang Theory assumed that the universe was "mathematically flat" (explained in the next paragraph) in all directions. If not "flat", it would have collapsed on itself shortly after the Big Bang or it would have flown apart so quickly that galaxies would never have been able to form. The original Big Bang required the universe to be flat within one part in 10^59 (one with 60 zeros following it). This is obviously possible but is it realistic? The term "flat" is a mathematical term that represents the rate of expansion of the universe, meaning the expansion rate will neither increase or decrease, i.e. it will remain the same (or be "flat"). Being mathematically "flat" has nothing to do with the shape of the universe, it is a term to describe (poorly) the rate of expansion in all directions. It means the universe is a spherical type object expanding equally fast in all directions sort of like blowing up a balloon. In the Big Bang model, time is run backwards according to General Relativity until the universe reaches a critical density called the Plank Density. General Relativity ceases to be valid when the density of the universe exceeds the Planck Density which is 5 x 10^93 grams per cubic centimeter. This is an enormous number - roughly 100 billion galaxies squeezed into the size of an atomic nucleus! Beyond this point Einstein's equations are meaningless, the laws of physics breakdown, and so we can not project anything earlier than this time. The Plank Density occurred at just 10^-43 of a second after the Big Bang and anything earlier than this can not be explained by modern day physics. The tremendous expansion of inflation means that regions that we see widely separated in the sky now were much closer together before inflation and thus could have been in contact. Inflationary Theory predicts unequivocally that the universe should be exactly flat. The universe appears to be flat out to the farthest distance that we can see. The recent satellite WMAT found the universe to be "flat" with an error of only 0.5%. The rapid expansion of the universe tremendously diluted the concentration of any magnetic monopoles that might have been produced. Calculations indicate that they have become so rare in any given volume of space that it would be very unlikely to ever encounter one in an experiment to search for them. As a bonus, Inflation also explains the structure of the current universe. Prior to Inflation, the portion of the universe we can "observe" was microscopic. Quantum fluctuations in the density of matter on microscopic scales expanded to astronomical scales during Inflation. Over the next several hundred million years, these higher density regions condensed into stars, galaxies, and clusters of galaxies in the universe as we now know it. While Inflation at this point is still a "theory" because there is no hard evidence of it. There has been some "soft" evidence that Inflation really did occur. 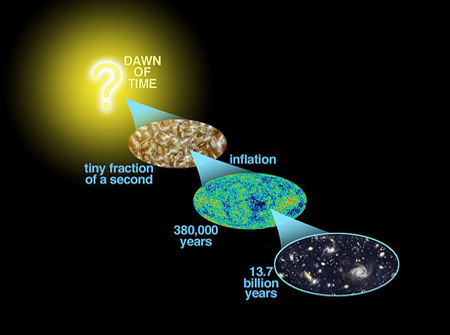 Many years from now if Inflation is not part of the of the early universe theory, then it will probably have been replaced by something quite similar. As shown in the chart at the left developed by Alan Guth himself, the universe went through an expansionary phase that was faster than the speed of light (space-time is not limited by the speed of light, only objects "within" space-time are). 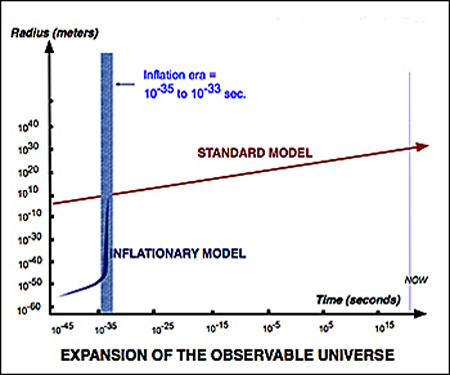 In this brief interval of Inflation, the "observable" universe expanded by a factor of about 10^70 (1 followed by 70 zeros) from being unimaginably smaller than a subatomic particle to about the size of a grapefruit. That is the equivalent of going from about the size of a grape to the current size of the observable universe in the blink of an eye - awesome! Note that Inflationary theory does not say anything about the "whole" universe, only the observable universe. The Inflationary model does not make any statement about the whole universe which could in fact be infinite. See paper on Inflation by Alan Guth. What caused Inflation to happen? Cosmologists are not sure of this and several theories exist. Guth proposed that the super cooling initiated a anti-gravitational field which then caused a violent growth spurt. There were some side issues with Guth's proposal and Andrei Linde of Stanford suggested "New Inflation" which could have various triggers, among them a random fluctuation of the initial field. There are several other theories floating about including one from Paul Steinhardt of Princeton, who has championed an alternative to Inflation, in which the universe begins from a collision between a pair of universes known in string theory as "branes", short for membranes (see Branes in string theory sister page). The important cosmological feature added by Guth is the rapid expansion of the very early universe which then blends in smoothly with the standard Big Bang theory. Inflation solves the above three issues with the initial theory and has now been incorporated as part of the standard Big Bang Theory. The recent WMAP satellite measurements are very consistent with the Guth type inflation models providing the first evidence for Inflation. (See the WMAP section under Early CMB Maps on the Microwave page.) At the end of the Inflation period, "Reheating" began to take place. Reheating. (10^-33 to About 10^-10 Of A Second) Inflation was a period of super cooled expansion and the temperature dropped by a factor of 100,000 or so and continued to be cool during this phase. When Inflation ended the temperature returned to the pre-Inflationary temperature, back up by a factor of 100,000. This period is called "reheating". The huge potential energy of the inflation field suddenly decayed and filled the universe with elementary particles and radiation similar to water vapor in the atmosphere condensing into water droplets forming a cloud. Because the fundamental principles of Inflation are not known, this process is not well understood. During Reheating, the elementary particles - photons, gluons, and quarks - were formed, but in a plasma state. Quarks and anti-quarks began to annihilate each other. However, for reasons not yet figured out, the mutual destruction of quarks and anti-quarks ended with a surplus of quarks. Because of this discrepancy stars, planets, and human beings exist today. Particle Era. (10^-10 to About 10 Seconds) As the universe continued to cool, the particle era consisted of the formation of two particle families - hadrons and leptons. Hadrons then formed two additional families - baryons and mesons. Hadrons are formed from quarks and baryons are "normal stable everyday matter" consisting of three quarks. Mesons are "short lived unstable particles" made of one quark and one anti-quark. All of the new mesons quickly annihilated each other leaving only protons and neutrons which would make up the nuclei of future atoms. The hadron epoch ended at about one second. After Inflation, the universe slowed down to the normal "Hubble Rate" and was filled with radiation and elementary particles, sometimes called "quark soup". As the universe continued to cool, new particles were formed out of pre-existing ones. 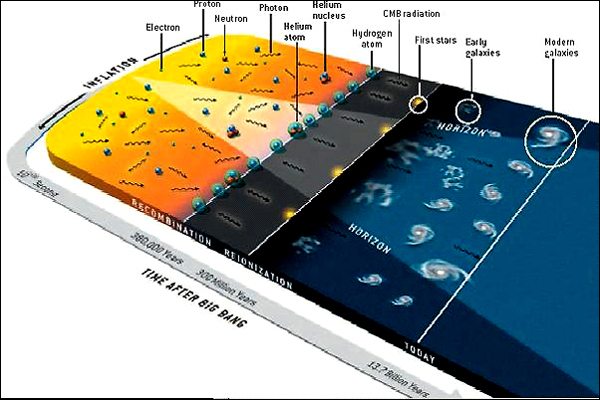 This early formation phase is called the Big Bang Nucleosynthesis (BBN). With the temperature falling below 10 billion Kelvin, BBN took place from about ten seconds to about twenty minutes. 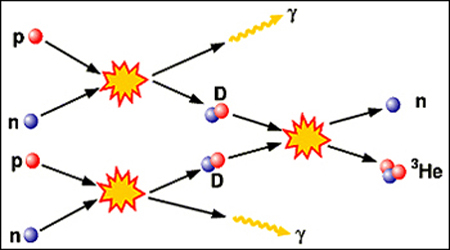 The diagram at the left illustrates two of the common nuclear reactions which occurred during the BBN. It shows single proton ions and neutron ions combining to form deuterium nuclei, D, (containing one proton and one neutron) plus the emission of high energy photons, γ. Subsequently it shows two deuterium nuclei fusing to produce one nucleus of helium-3 (with two protons and one neutron) and one free neutron. Note that "atoms" were not yet forming, the above reaction shows just the "nuclei" of future atoms forming from ions. Experiments can be done in labs today demonstrating these early BBN nuclei reactions. The BBN theoretical calculations result in a nuclei abundance of about 75% hydrogen (1 proton nucleus), about 25% helium (2 protons and 2 neutrons in the nucleus), and about 0.01% of deuterium (1 proton and 1 neutron nucleus). Without this abundance of hydrogen nuclei, there would be no water and therefore no life as we now know it. That the observed hydrogen and helium abundances in early distant galaxies are very consistent with the above theoretical calculations is considered "strong evidence" for the Big Bang Theory. 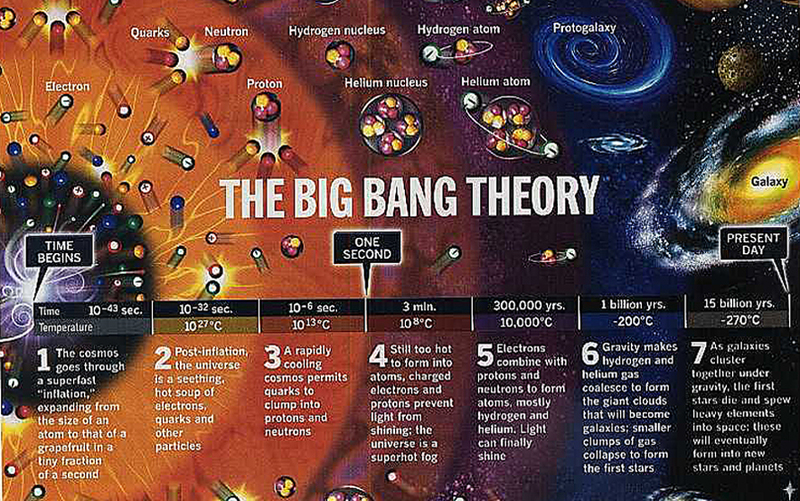 Big Bang Nucleosynthesis is one of the three pillars of support for the Big Bang Theory. Measurements from the WMAP satellite over nine years of collecting data (2001 to 2010) has recently confirmed the above ratios with much greater precision. The Dark Ages. After the first twenty minutes or so, the universe settled down to a much longer period of expansion and cooling in which change was less dramatic. High energy radiation (photons) dominated the cosmos. As the universe continued to cool, more and more matter was created. Expansion caused radiation to lose more energy than matter so that after a while, matter (nuclei) particles exceeded massless particles (photons). About 70,000 years after the Big Bang, radiation and matter were about equal in density, shortly thereafter matter began to dominate. Recombination (380,000 Years) For the next 310,000 years the universe continued to expand and cool, but was still fiery hot and dark. Any visible light was immediately scattered by collisions with the ubiquitous electrons and protons. It contained only the simplest elements, mostly hydrogen and helium ions. As the universe cooled further, the electrons (with a negative charge) begin to get captured by the ions (with a positive charge) forming atoms (electrically neutral). This process happened relatively fast and is known as "recombination". The first bits of structure began to form. These small clumps of matter grew in size as their gravity attracted other nearby matter. At about 380,000 years of cooling, light (photons) began to travel through the spaces between the atoms which now "bond" the electrons in their orbits. The universe had become transparent. Cosmic Microwave Background (CMB). 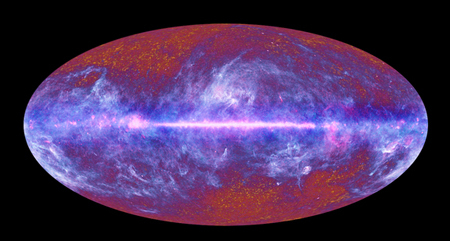 The first early radiation that could freely travel was the CMB, the remnants of which we can detect in the current universe 13.75 billion years later. 380,000 years is the earliest point in time we can ever look back and "see" because everything before that was part of the dark ages. Note the CMB picture to the left taken by the European Space Agency (ESA) Planck satellite. The Planck satellite launched in 2009 is the third satellite exclusively designed to map the early CMB. NASA has previously launched the COBE in 1989 and the WMAP in 2001. Check out the Cosmic Microwave Background web page. Currently, the earliest galaxy we can "see" is MACS0647-JD which is believed to have formed about 420 million years after the Big Bang.